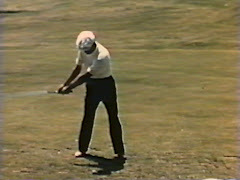 My theory is based on searching for the automatic golf swing motion in that all depends on a human body limitations rather than possibilities. Let me explain shortly why - in order to make a movement automatic there must not be any free capability left in a specific motion, otherwise timing issues come along. Less timing issues = less small thoughts and concepts = more coordinated motion = more repeatability and consistency - this is the motto of the Biokinetic Golf Swing Theory. Everything You Always Wanted to Know About Shallowing But Were Afraid to Ask. Before we proceed to the Part 4. of the series devoted to the lengthening of the flat spot we need to explain the process of decreasing the angle of downswing path which is also known as shallowing of the path or club or shaft in macroscale. This is, by the way, a very hot topic in the golf instruction nowadays. 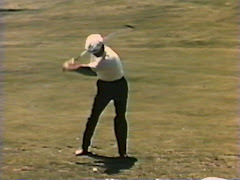 The golf swing action takes place in a 3-D spacial world. 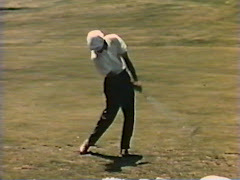 It means that -- taking into account the ball lies on the ground -- golfers need to use both vertically as well as horizontally oriented movements. 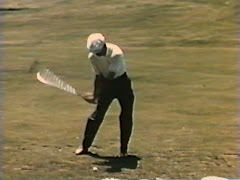 Since the goal is to hit the ball our mind partially associates it with a "chopping wood with an axe" up and down pure vertical motion (power element) with a vivid help from gravity. Unfortunately, it is not so easy. Hitting onto the ball is not enough to play golf. The goal is to hit the ball the way it goes to the West (assuming we face North when taking stance). This brings a "pushing down the line" from the East to the West pure horizontal motion (direction element) into play (vector of which does not act always in accordance with the gravity). The inavoidable mixture of both elements determine the characteristics of the downswing path of the club of course together also with the backswing path characteristics. and all possible random combinations of the above actions. Enlarging the spine tilt (a.k.a. secondary spine tilt) is a natural phenomenon on the subconscious level and occurs in all correctly performed swing motions since we are bipeds and we transfer the dynamic weight in accordance with the orientation of the motion, i.e. to the West. When our head remains more or less stationary the amount of the spine side tilt must simply increase. Just to add, we recommended creating the tilt as large as possible at setup in our previous article so that the amount of its increasement (and, therefore, a timing-prone change in the swing) was reduced. Thrusting hips forward (to the North) is just a phenomenon called early extension. This is something that we do not want in our swings since it brings lots of problems and should be eliminated, not promoted. We shall not deal with it any more then. 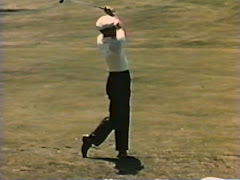 Wrists action (rear wrist dorsal flexion and/or lead wrist palmar flexion) as an unintentional move is rather rare and happens usually when the backswing ends very high independently on the backswing characteristics. It can be natural for Koepka's slight OTT-from-Inside pattern as well as for D.Johnson's slight reverse rerouting one. 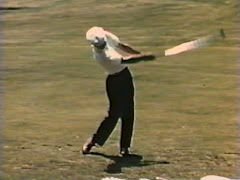 Pushing arms or specific part of them forward (to the North) is just subconscious movement of the hands and/or rear elbow/forearm forward while letting the clubhead drop gravitationally down; the famous OTT-from-Inside procedure descripts this very well in detail. This is the most natural scenario for the vast majority of people because the orientation of the motion is in accordance with the orientation of the pivot. 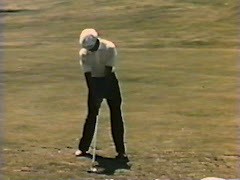 The motion of the hands forward shallows the shaft per se, however, additional shallowing moves (as e.g. humerus external rotation -- see: Hogan or wrist motion -- see: Koepka) can be of further assistance as well. 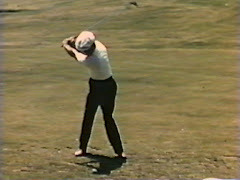 This scenario is usually related to inside backswing paths and closed stances. Clockwise rotation of arms or specific parts of them practically happens unintentionally to a bigger or lesser degree in all motions. However, a special place here is reserved for the so-called reverse rerouting procedure golfers. 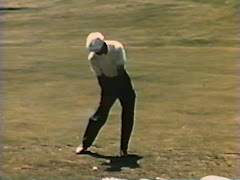 It is natural scenario only for a small percentage of golfers because the first move after transition is against the orientation of the entire motion. Additional shallowing moves (as e.g. 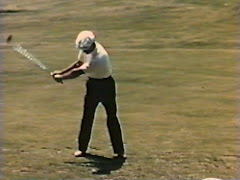 wrist motion -- see: D.Johnson) can be of further assistance as well. This scenario is usually related to outside backswing paths and open stances. After this introduction we can proceed to work on Part 4. of the series that will concentrate on presenting the most efficient shallowing procedure for our goals. Hopefully everything is clear now as the question of shallowing is often misunderstood in macroscale and the errors in understanding can be easily transferred to the microscale. Prepare your body and your mind to automatic motion and just let it happen. Find your own physical limitations and let them speak for you. You need only to make them appear in your motion.